In the early 1900's Rainhill County Lunatic Asylum had over 3000 patients, reputedly making it the largest asylum in Europe. It was demolished in the early 1990's and subsequently replaced by the Reeve Retirement Village and a housing development. 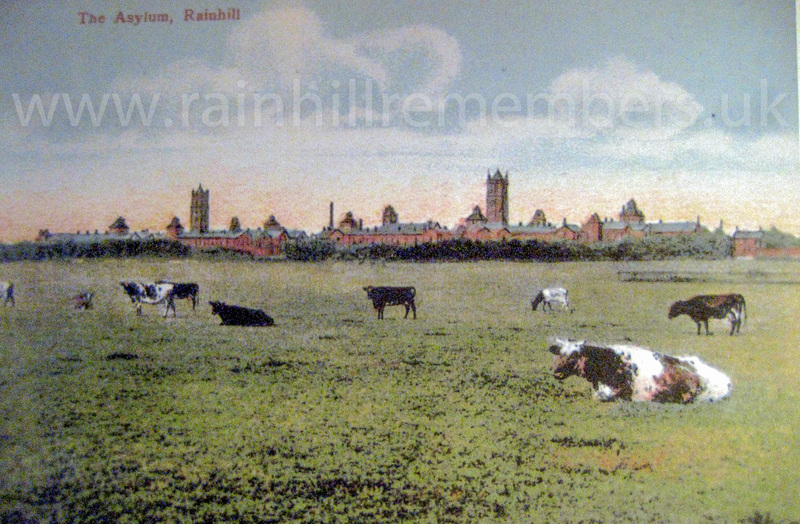 At the time of the First World War, Rainhill Asylum was extremely over-crowded with 2395 patients. 110 staff had been called up and 4 out of the 6 medical staff had joined the RAMC (Royal Army Medical Corps). In the first 9 months of 1918 there were 498 deaths, 119 of which were from tuberculosis and the remainder from the Spanish flu epidemic. 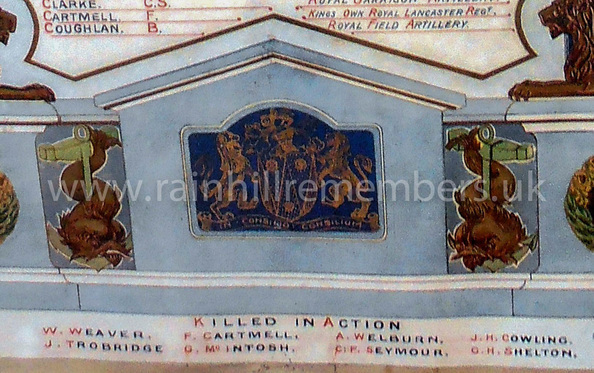 The Asylum understandably had a large number of staff who lived in Rainhill and the surrounding areas of St. Helens and those that fought in the Great War were recognised on a painted memorial which was once on display in the Asylum. Unfortunately the whereabouts of the memorial below is now unknown. 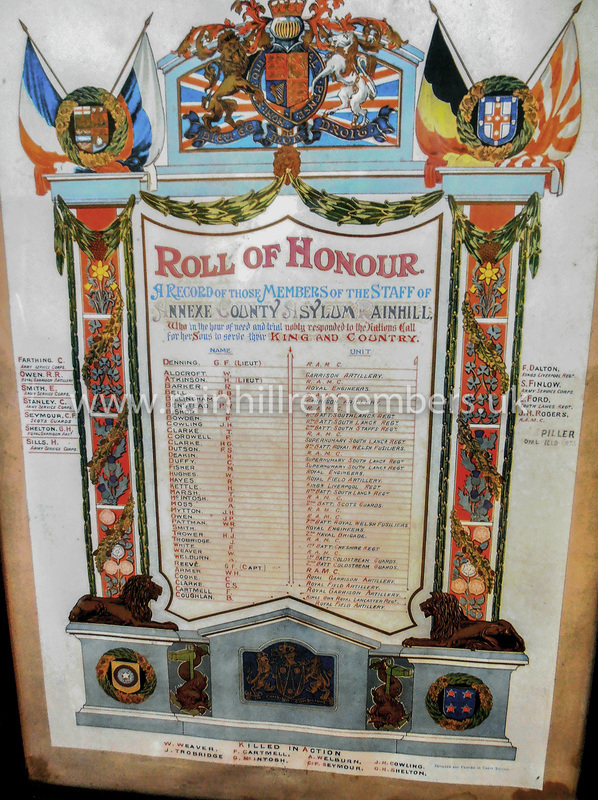 ​A Roll of Honour (painted on wood) from the Asylum was saved and is now in the possession of Rainhill British Legion who gave permission to reproduce it here. Below is a close up of the foot of the Roll of Honour showing the names of eight members of staff who were killed in action - the names being added later. 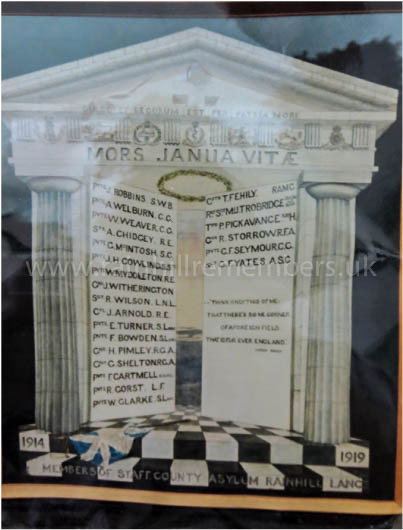 The text under the Roll of Honour heading is transcribed below together with the names of staff members shown listed in alphabetical order for ease of reference. BISHOP J. 11th batt. South Lancs. Reg. BOWDEN F. 11th batt. South Lancs. Reg. CORDWELL F. Supernumerary South Lancs. Reg. DALTON F King's Liverpool Reg. DEAKIN H. Supernumerary South Lancs. Reg. DUFFY C. Supernumerary South Lancs. Reg. FORD E. South Lancs Reg. HAYES R. King’s Liverpool Reg. KETTLE H. 11th batt. South Lancs. Reg. 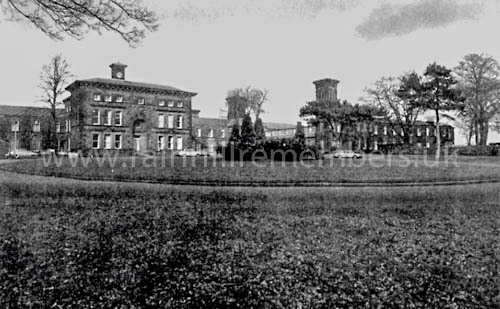 Rainhill Civic Society research has uncovered some brief details about a few of the men treated at the Rainhill Asylum, but would welcome any further information about these men or other soldiers who received treatment there. If you feel you can throw any further light on the matter please contact us via our Contact page.